In the latest Civilization VI: Gathering Storm civ reveal, the Swedes return to the iconic 4X strategy series. Queen Kristina replaces Civ V’s Gustavus-Adolphus – she came to the throne in 1632 at the age of six (though she didn’t start ruling until 18) and was one of the most learned women of the her time. Sweden’s unique ability is Nobel Prize. The Swedes get extra Great Scientist/Engineer points from universities and factories, and generate +50 diplomatic favour when they earn a Great Person. More excitingly, their very presence in a game enables all civs to participate in three Nobel Prize competitions in the World Congress. From the trailer (below), it looks like the Nobel Peace Price is one of these – participants will gain score by generating diplomatic favour, with the reward coming in three tiers, each awarding different Great People. Presumably, the winner will earn all three tiers, as in World Congress competitions from Civilization V.
Sweden’s unique improvement is the Open-Air Museum. They may only build one per city, but it provides loyalty, as well as bonus culture and tourism for each different terrain type on which a Swedish city has been settled. Their unique unit is the Carolean, an anti-cavalry Renaissance infantryman that is faster than the Musketman it replaces, and gets additional combat strength for any of these extra movement points it hasn’t spent. Kirstina’s leader ability is Minerva of the North. If a building has at least three Great Works slots, or a Wonder has two, then they automatically get their theming bonus when those slots are filled. 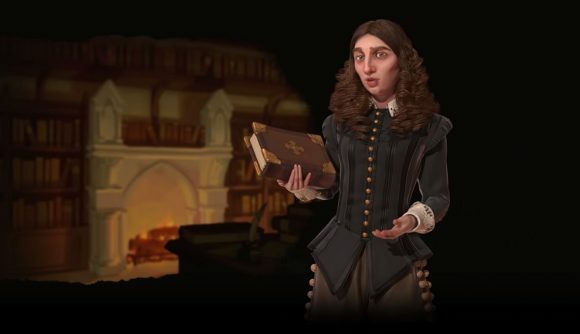 Kristina also gets a special building in the Government Plaza, the Queen’s Bibliotheque – it has six Great Work slots (two each for writing, music, and art) and grants a governor title, as well as the Mercantile Legacy policy. Sweden look really cool, and under Kristina they have strong synergistic benefits when you focus on Great People. They get loads of bonuses for a cultural victory, with the Open-Air Museum being the most interesting – there’s a sly nudge to expand and claim lots of varied terrain there, which is a little counter-intuitive for peaceful Sweden, but at least the loyalty bonus means isolated cities should be at less risk of revolt. If you don’t fancy that, Nobel Prize’s small but substantial bonus for engineers and scientists enables a clustered, tall empire to shoot for a science victory. Either way, it’s clear that Great People will be a huge part of your strategy, and all the favour you’ll get from them offers a pivot to the diplomatic victory if someone else is winning the space or culture race. You’ll get to try it for yourself on February 14, when Gathering Storm has fully gathered.